Be sure you check with your manufacturer for their recommended methods and tolerances. 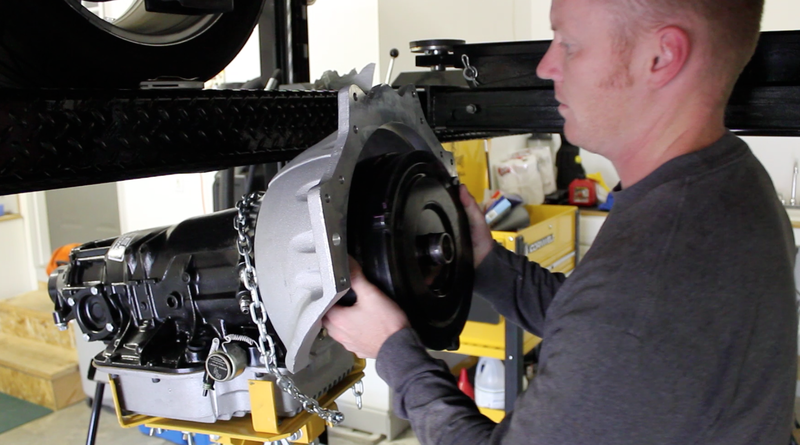 This is a vital step in ensuring a long lasting transmission AND motor. Seat convertor on transmission. Rotate the convertor clockwise to make sure it is seated all the way back. You must be sure the convertor is seated all the way. 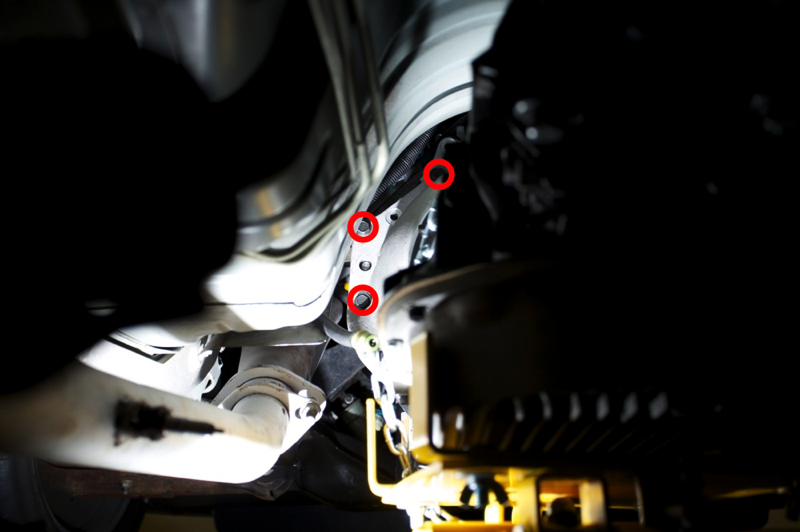 Once the convertor spacing has been settled, you will need to perform a final torque of the transmission bolts to 37 ft-lb (Service Manual 1999 7-323). Torque in typical star like pattern. Check the bolt length ensuring the proper length. You may have to get shorter bolts, longer bolts, or use a washer to shorten the bolts like I have in one of the photographs. Bell housings differ in thickness and you don't want to tighten a bolt into your engine block. Tech Note: Check the bolt length ensuring the proper length. You may have to get shorter bolts, longer bolts, or use a washer to shorten the bolts like I have in one of the photographs. Bell housings differ in thickness and you don't want to tighten a bolt into your engine block. My 1999 LS1 block transmission bell housing bolt maximum depths (bolts tightened to 20 in-lb to get measurements). 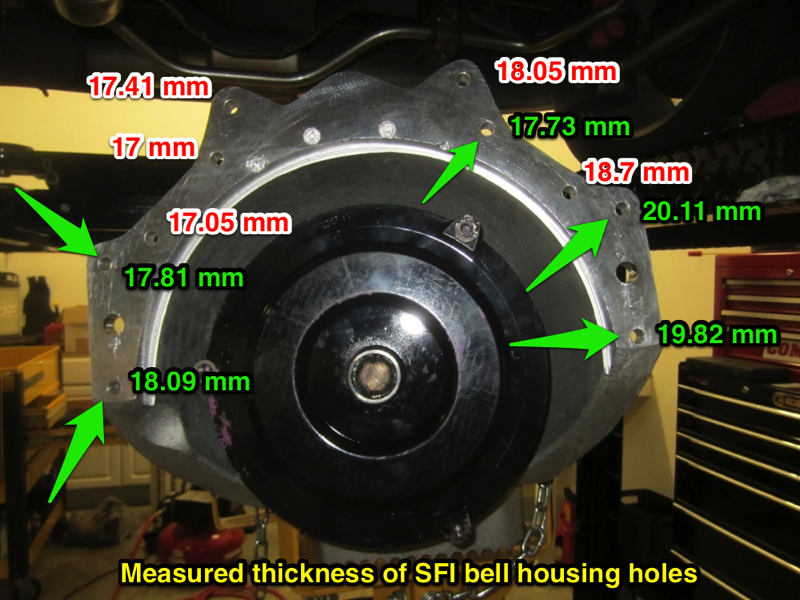 My bell housing hole thickness measurements. 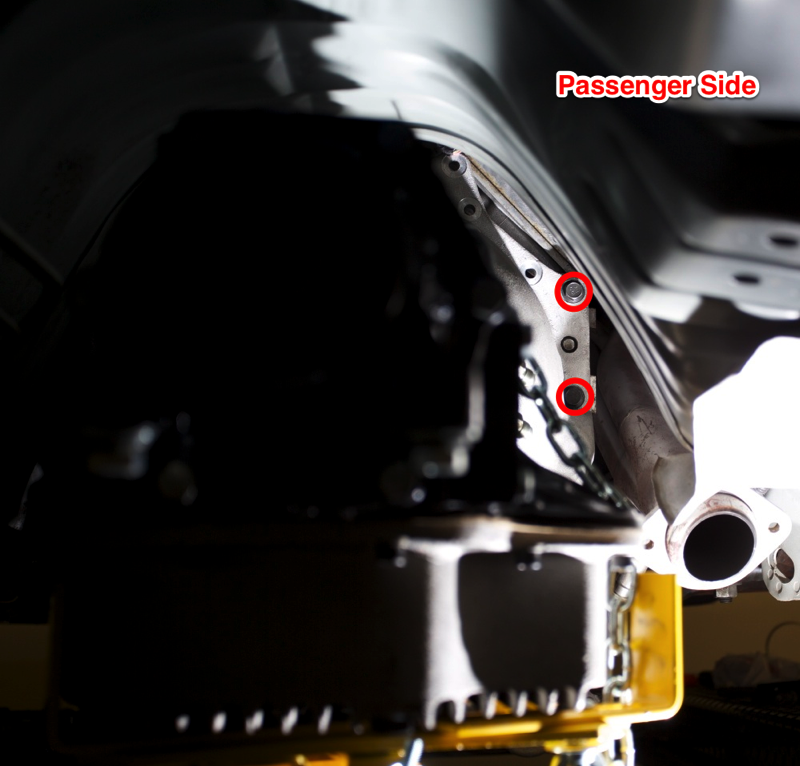 Check the clearance between flex plate bolt pad and convertor bolt pads. 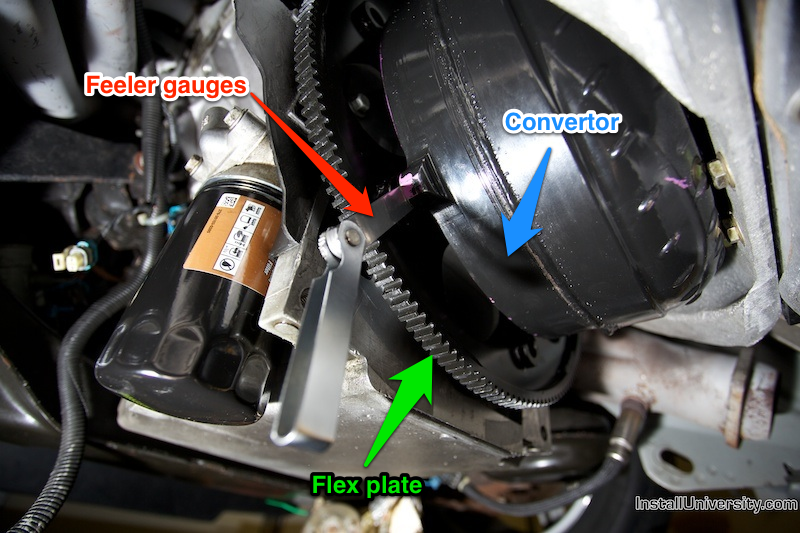 Feeler gauges were stacked between the convertor and flywheel to determine the gap. If your spacing falls between 1/8" and 3/16" you can skip the shimming process. Be sure you check with your manufacturer to ensure this is correct. Be sure you have the correct bolt pads on the flex plate. Using the feeler gauges, the measured gap was 0.215". 1/8" - 3/16" (0.125" - 0.1875") is the recommended gap for my transmission and LS1. Check your manufacturer recommendations. I previously measured a 0.215" gap. Shims will need to be used to close the gap between 1/8" and 3/16". My personal preference is to shim as close to 3/16" as possible. Check with your manufacturer for their recommendation. 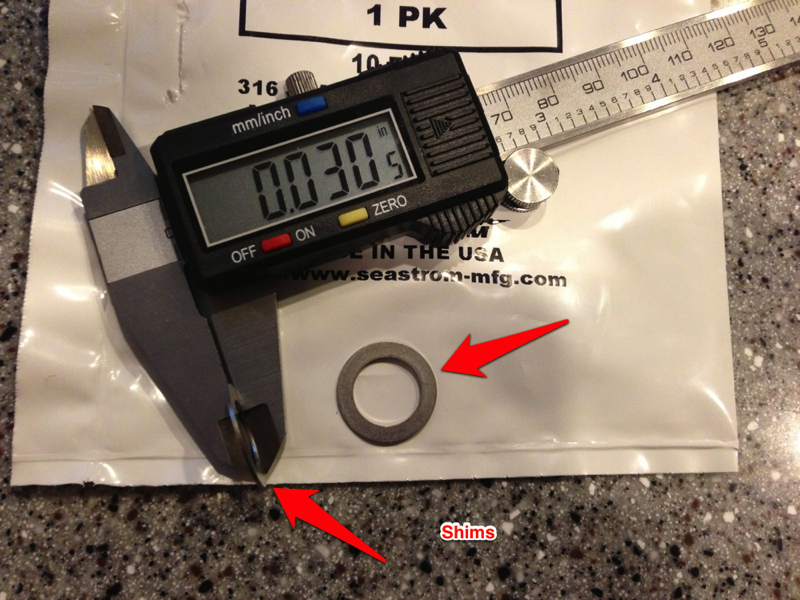 I ordered 0.030" thick shims (part number 97022A497) from McMaster.com. Search for shims, not washers. Shims should hold a very tight tolerance on thickness where washers vary greatly. 0.215" - 0.030" = 0.185" This is almost dead on the 3/16" (0.1875") tolerance I wanted. Note: 0.025" thick shims would have been acceptable to me but I decided to stay in the recommended gap per Rossler Transmission. The convertor pilot needs to be checked to be sure you have at least 1/8" of the pilot into the crankshaft pilot hole. Mark off the recommended distance using a marker and take a flashlight and look up and see if the mark disappears. If it disappears, you should be good to proceed. If the pilot does not engage at least 1/8", stop and consult an expert. 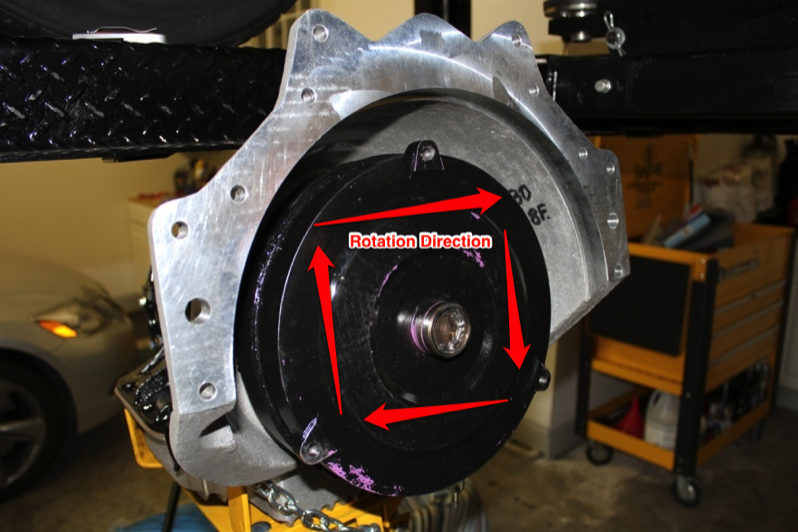 Rossler Transmissions has an excellent write-up for spacing your transmission correctly in their Tech Tips section. Again, be sure you ask your manufacturer their recommendations. 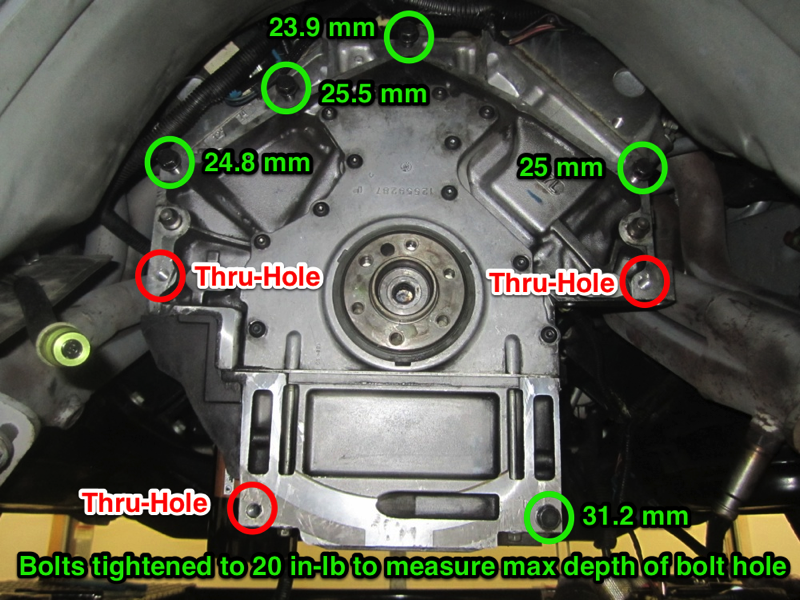 Once the convertor spacing is completed, place red lock tight on bolts and tighten the convertor bolts to 44 ft-lbs (Service Manual 1999 7-324). The bolts will have to be installed where the starter bolts to the block. Check the bolt length ensuring the proper length. Tech Note: Convertor bolts need to be Grade 8 (Metric Class 10.9) and measured to ensure proper length. I ordered the Summit Racing ARP convertor bolts. M10 Size, 15 mm under head length, 1.5MM Pitch, Fully Threaded part number ARP-230-7305. This is the typical hex head. I wished I had gotten the shorter head version for extra clearance and that was my intention but the photo was misleading. Either way, it worked out.